We are only a decade or two away from a new era in human existence: global population will begin to decline. Not too long ago world population was projected to surge from the current 6 billion to 14 billion or more by the end of this century, creating great strain on the world’s resources, and in part fueling the whole environmental movement. Now, the UN Population Division’s projections have been dramatically scaled back. One plausible scenario shows global population peaking around 2040 at 7.5 billion, then falling to 5.5 billion by 2100. Yet if recent trends in fertility rates continue, these numbers are too high, and global population could peak within a few decades. One long-term scenario projects world population shrinking to only 2.3 billion people by 2300! The most significant change in global demographics in the past few decades has been a dramatic decline in fertility rates in almost every country on the planet. In order for population to remain constant over time, total fertility rates must be approximate 2.1. Every woman must on average have 2.1 children; one to replace herself, one to replace her partner, and a little extra to make up for women who don’t have children. As recently as 1970, fertility rates in less-developed nations were about 6. They have subsequently collapsed, at a faster rate than anyone could have imagined. Total fertility rates in LDCs are now 2.75, and they are still falling. Fertility rates have fallen faster in LDCs than they ever fell in developed countries. Fertility rates in Greater Europe have fallen from 1.8 in 1980 to 1.3 today, a level previously thought unimaginably low. Europe is already losing about 700,000 people per year, a figure that will grow to about 3 million per year or more by mid-century. By the year 2050, Europe will have lost about 100 million people; population will likely decline from today’s 730 million to 630 million or (probably) less. If fertility rates and immigration in Europe do not increase from current levels, European population could fall by 130 million by 2050. That’s equivalent to losing almost half the current population of the U.S. Italy has a fertility rate of 1.2, Germany 1.35, Russia 1.1, Spain 1.15, Switzerland 1.4. Europe has about twice the population of the U.S., but only takes in about 376,000 immigrants per year, about one-third as much as the U.S. does. In order to keep its population from shrinking, Europe would have to “import” almost 2 million immigrants per year. If Europe wanted to maintain a constant dependency ratio (retired workers/active workers), annual immigration would need to be over 27 million! The majority of European immigrants are muslims, mostly Arabs. Given current political realities, a significant increase in immigration is extremely unlikely. Thus, significant population decline is virtually certain. The inevitable population decline that developed countries will suffer will dramatically reduce the influence of “Western” civilization in the world. In 1950, the West represented about one-third of global population. By 2000 this had declined to 20%, due to the population explosion of LDCs. By 2050 the West will shrink to 14% or less. Europe’s share of world population was 22% in 1950, 12% in 2000, and will be 7% or less in 2050. Good-bye Europe… One demographer estimates that for every 1,000 Europeans in the year 2000, there will be only 232 in the year 2100! Russia is losing almost 1 million people per year and its fertility rate is only 1.1. Russia could lose 30% or more of its current population by 2050! Japan’s population will begin to decline within a few years. Its fertility rate is only about 1.3. The number of people 15 years and older will likely stop rising in the next year or two, and it only increased 90,000 in the past year (0.08%). Japan’s workforce peaked in 1998. The number of people employed peaked in 1997 and has fallen by 215,000 since. Fertility rates have probably already fallen below replacement level in countries such as Mexico, Brazil, and Iran. This was almost inconceivable just a decade ago. South Korea and Hong Kong are among the countries with the lowest fertility rates in the world: only 1.17 and 1.0, respectively. The U.S. is the only developed country in the world that will continue to grow in coming decades; U.S. population will grow by about 100 million (one-third) by 2050. The fertility rate in the U.S. is about 2, and that is by far the highest fertility rate of any modern nation. U.S. population growth will be driven exclusively by immigration. China’s population will grow about 13% between now and 2025, reaching 1.45 billion, but then it will begin to shrink. Its fertility rate is 1.8, despite its “one child” policy. India will become the most populous country in the world by 2035, and its population will continue to grow, reaching a peak of about 1.5 billion by 2050. India’s fertility rate has plunged from 5.4 in the early 1970s to less than 3 today. There are about 1 billion Muslims in the world. Fertility rates in Muslim countries have also collapsed. Muslim countries will begin to lose population around 2050. Muslims will continue to represent about one-sixth of the global population. Government-sponsored retirement schemes are in trouble. The problem is a combination of increased life expectancy and a baby bust. Populations in all developed countries will be aging dramatically in coming years. The median age in the U.S. in 1950 was 30; by 2000 it was 35; in 2050 it will be 40 or more. The median age in Europe in 1950 was 29; in 2000 38; in 2050 it will be 48 or more. Japan will age even more dramatically: 22, 41, and 53. When populations cease growing and start shrinking, economies become more like a zero-sum game. To increase your share of the wealth pie, someone else has to accept a smaller share. Construction doesn’t open new expanses of land to development, it mainly concentrates on replacing and improving existing structures. Productivity becomes the key to growth. Demographic trends are already influencing differential growth rates in the U.S., Japan, and Europe, and this will only intensify in coming years. If you were a member of an aging Japanese or European economy with minimal growth prospects, wouldn’t you prefer to invest your retirement funds in the biggest, most modern economy in the world, especially since it is virtually guaranteed to be the only one to grow significantly over the balance of your lifetime? Doesn’t this help explain why the U.S. has a persistent and growing current account deficit? By this same logic, capital inflows to India and China could be intense in coming years; it seems virtually certain that the world will have only three main economic engines in coming decades: the U.S., India, and China. The stock market is spooked today, with prices dropping and implied volatility soaring. This is arguably the most significant "panic attack" the market has had since earlier this year. In my informal survey of the news today, I see almost universal concern that the positive GDP report yesterday was just a blip, that the economy remains very weak and vulnerable to another decline. Of 10 stories about the economy, at least 9 look at the numbers and can't find any reason to be hopeful. I think this is an exaggeration, but panic attacks like this are part of any recovery story. When the market suddenly gets scared, my first reaction is to check the status of the market-based indicators of economic fundamentals to see if anything has changed. I can't find any evidence of deterioration in the numbers. 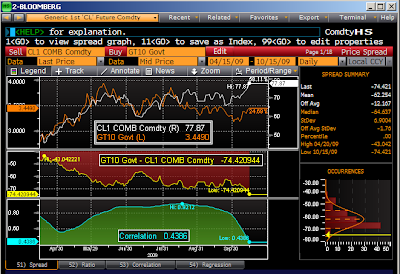 Take this chart, for example, that shows spot commodity prices at their highest level of the year. Swap spreads (next chart) show absolutely no sign of any increased tensions in the market. In fact, you couldn't ask them to be better-behaved. CMBX and ABX prices are still in a rising trend. Inflation expectations built into TIPS prices are near their highs of the year, suggesting that the bond market isn't worried at all about a deflationary slump. Sep. '10 eurodollar futures are trading at all-time highs, suggesting that the market is not concerned at all about an imminent Fed tightening which might upset the economic applecart. Perhaps it's just that Halloween has come a day early. The Fed continues to expand bank reserves (first chart), but its balance sheets remains relatively unchanged in aggregate over the past year (second chart, source here). Further, as seen in the second chart, the Fed has bought enough Treasury bonds by now to replenish what it "lost" in last year's panic, flight-to-quality. They will continue to buy agency and mortgage-backed securities, but these purchases will likely be offset by declines in the "other" categories. 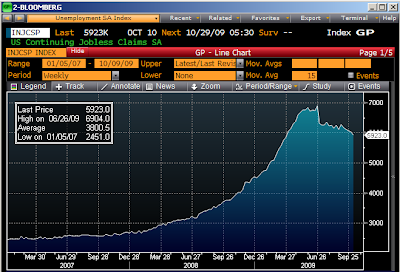 The big question thus remains: how and when will the Fed start reversing this huge addition to bank reserves? The Fed will eventually have to sell, by hook or by crook (and it is already experimenting with ingenious ways to do this) about $1 trillion worth of agency and MBS. Whether this by itself will push interest rates up, or whether rates will rise because the economy is picking up and that is the justification for the Fed to reverse its liquidity injections, it doesn't much matter. The bottom line is this: if the economy continues to grow at a 3-4% rate, as seems likely to me, then interest rates on Treasury bonds are going to go up significantly, and rising Treasury yields will in turn push agency and MBS yields higher as well. The market is currently happy with 3.5% yields on 10-yr T-bonds, but only because the market doesn't believe that this economy has the potential to post continued, decent rates of growth. If and when that perception changes to one of expecting 3-4% growth (or even more: see my previous post), then Treasury yields will inevitably move significantly higher. So it's not worth your time worrying about how the Fed will reverse its quantitative easing; the main driver of interest rates will be economic growth. And of course inflation is going to play a role in rising rates as well, but the market won't worry about inflation until it first becomes convinced that the economy has the ability to grow by at least some decent rate. When it comes to Treasury yields, it's all about economic growth. As the first chart shows, GDP growth has snapped back to "normal" following a record 4 quarters of negative growth. But as the blue and green lines in the second chart suggest, the economy today is about 10% below its "trend" or potential level (extrapolating from the past). Stated another way, our national income is about $1.4 trillion less than it otherwise might have been if we hadn't suffered from the real estate/financial system collapse of the past few years. Before proceeding further, I'm going to step back and engage in some "inside" thinking (see my post on this subject yesterday). We all know that the economy is facing enormous headwinds: 10% unemployment that is going down very slowly; an administration determined to ramp up government spending and tax burdens to new post-war levels; trillion-dollar federal deficits for as far as the eye can see; states and municipalities that are bitterly strapped for cash; broken credit markets; a commercial real estate disaster waiting to happen; a second wave of residential foreclosure sales; consumers retrenching and deleveraging; and a Fed that will soon have to withdraw over $1 trillion in liquidity or face an explosion in inflation. Add all these concerns up and you have the "new normal" environment where the economy struggles to grow by 2% or so per year in perpetuity. Since the market is fully aware of these abundant "inside" facts, it is no wonder that 10-yr Treasury yields are only 3.5% despite the prospects of a multi-year, trillion-plus annual deluge of Treasury supply. It is no wonder that the S&P 500 today trades at the same level as it did over 10 years ago, even though corporate profits (per NIPA) have risen some 70% over that same period and are currently beating expectations almost every day. It's no wonder that corporate credit spreads are trading at levels that in the past have signaled the onset of recession. In short, the outlook is miserable and the market is priced to miserable expectations. Now let's engage in some "outside" thinking. That's summed up in the purple, dashed line in the second chart. (New readers might want to refer back to this post on Milton Friedman's "plucking" theory of growth, and to this post from the Atlanta Fed that demonstrates how the strength of a recovery is largely a function of the depth of the preceding recession.) For the past 40 years, the economy has managed to grow on average about 3.1% per year: this would be the economy's "potential" growth rate. Currently the economy is about 10% below this potential, making this recession the most painful, in some respects, of any since the Depression. Let's say that because of all the headwinds out there that it takes the economy eight full years to recover to its potential; this would mark by far the slowest recovery to trend ever observed since the Depression. Yet despite being a miserable recovery, we would still see growth of 4.4% per year, and that is about double the rate of growth that many optimists are calling for. The inside view says the outlook for growth is miserable, while the outside view says that there is a decent chance (not a certainty of course) that growth could be much stronger than the market expects, and for many years, even though the economy faces significant obstacles (headwinds) to growth. Since the market is not even remotely prepared for such an outcome, risky financial assets such as equities and high-yield debt could enjoy excellent returns even as the economy struggles to get back to its trend growth path. Imagine what could happen if some of the assumptions held by the inside view were to be challenged: what if electoral upsets next week and next year result in fiscal policies which rely more on supply-side incentives and less on Keynesian fiscal stimulus? What if faster-than-expected growth reduces the deficit and makes tax cuts possible, instead of tax hikes? The possibilities are endless, and you don't have to be a congenital optimist to see them. Just use a little "outside" thinking. A quick update to this chart, which I haven't shown for several weeks. The 4-week moving average of claims continues to move down, even though claims recently have slightly exceeded expectations. The important thing is that progress is being made. I've known Bill Miller, Legg Mason's top equity manager, for a long time. He's had his ups (beating the S&P 500 for 15 straight years) and downs (especially last year when he was crushed), but I continue to admire his wisdom and insights (could it be because we both majored in philosophy in college?). I highly recommend reading his most recent commentary, since we are both thinking along the same lines these days, but coming from different directions. He starts with an insight from Michael Mauboussin's new book Think Twice (he's also a Legg Mason guy) which describes two very different ways of analyzing a problem: from the inside and from the outside. The inside view considers a problem by focusing on the specific task and by using information that is close at hand. The outside view...asks if there are similar situations that can provide a statistical basis for making a decision. The outside view wants to know if others have faced comparable problems, and if so, what happened. It’s an unnatural way to think because it forces people to set aside the information they have gathered. PIMCO’s Mohamed El-Erian is the most prominent advocate of the “new normal”, a term he coined to describe a recovery with real growth of 1-2%, persistently high unemployment, and much greater government involvement in the economy. He has recently warned of a big letdown from the “sugar high” we are now experiencing in the market and the economy as the effects of the abatement of the credit crisis and massive government stimuli, both fiscal and monetary, begin to wear off. He may be the most prominent, but he is not alone. In fact, it looks like he is the leader of a not so silent majority. The current consensus growth rate for the U.S. economy in 2010 is 2.4%. This is way below “normal” for the first year of a recovery. Projections such as these follow the classic inside view pattern: they look at current conditions, current trends, anchor on the most recent data, and adjust from there. A variant of the argument has it that with consumption elevated at 70% of GDP and the consumer retrenching, growth must be sluggish, profits will disappoint, and it will be hard for the stock market to make any headway. He goes on to note that past periods of huge consumer deleveraging and increased savings have not prevented the economy from growing at fairly impressive rates. He borrows from another friend of mine, economist Michael Darda, who notes that "The most important determinant of the strength of an economic recovery is the depth of the downturn that preceded it. There are no exceptions to this rule, including the 1929-1939 period." I've argued quite a few times that deleveraging need not mean slow growth, because growth doesn't come from leverage, it comes from work and investment. Debt and leverage can facilitate growth, by helping to distribute spending power to the nooks and crannies of the economy, but debt doesn't create growth since the money that one man borrows must come from another man's pocket. As market veteran John Mendelson often points out, it is not what people say that matters, it is what they do. And what they are doing is buying bonds and selling stocks. Through the first 9 months of this year, domestic equity funds had net outflows of $8 billion. During the first week of October, another $5 billion was redeemed. Bond funds, in contrast, had inflows of nearly $300 billion in the first 9 months of this year. Of the top 10 selling funds in America this year, 9 are bond funds and only one is a stock fund, and that one is the Vanguard 500 index fund. Finally, he notes that "every time stocks have performed poorly for 10 years, they have performed better than average for the next 10 years, and they have beaten bonds every time by an average of 2 to 1." Both Bill and I agree that these days it pays to be optimistic. One way businesses invest for the future is through capital goods orders (aka capex). Capex has risen smartly this year, probably for several reasons: 1) the decline last year was so severe that it was probably overdone, 2) businesses believe that there is hope for the future, and 3) corporate profitability is improving. Through September, Capex was up at a 10.8% annual rate since the freefall of last year ended last January, and up at a 8.1% annual rate since the low of last April. By either measure, capex is doing much better in the current recovery than it did following the 2001 recession. This makes sense given the severity and depth of the decline last year, but it is also an important confirmation of the fact that we are now in a recovery and things are improving and are likely to continue to improve. Capex is the seedcorn of future productivity, after all. This is the longest-running theme on this blog: whatever problems the economy has, a shortage of money is not one of them. I've used it to counter the widespread belief at the end of last year that the economy faced the threat of deflation. When money is plentiful, deflation is nearly impossible. We know money is plentiful, because the price of money, as reflected in the exchange rate of the dollar and the price of gold, has fallen. The Fed has tried very hard to ensure that its supply of dollar money meets and/or exceeds the world's demand for it, and it looks like they have succeeded. I've also used this theme to explain how the cause of last year's recession was a sudden decline in money velocity; people scrambled to increase their money balances by spending less and by effectively stuffing dollars under their mattress. This meant the recession was a giant shock to confidence which resulted in a huge increase in the demand for dollars. As confidence returned, I argued, money that was hoarded would get spent, and the economy thus had the ability to rebound rather quickly from its slump. All the signs I see suggest that the economy is pretty much following this script closely. We now have the data for M2 money growth in the third quarter: -1.9% (annualized). This is not a fluke, since M2 growth has been effectively zero since the end of March. The initial estimate of third quarter GDP is due on Thursday, and the consensus calls for nominal growth of 4.6% (3.2% real growth plus 1.4% inflation, annualized). Thus we can estimate that M2 velocity in the third quarter rose at a 6.7% annualized rate. (see chart above) I think GDP probably did a little better in the third quarter, which would make the increase in velocity even more impressive. Bottom line: money that was hoarded is now being spent, and this is driving the recovery. Money velocity (GDP divided by M2) is the inverse of money demand (M2 divided by GDP). So we can say that the big news in the quarter that just ended was a significant decline in money demand, after a major rise in money demand that dominated the economic news last year and earlier this year. Lots of evidence comes together to support this: as money demand has fallen, the dollar's value on the foreign exchanges has also fallen; growth in dollar currency has also fallen; and commodity and equity prices have risen as the world attempts to reduce money balances and increase exposure to more risky assets. It's all tied together with confidence: as evidence accumulates that the economy is not falling off a cliff and banks are not going to disappear massively, money comes out of hiding. Dollars that were stored are being spent, converted to other currencies, and/or exchanged for more risky assets. I still see lots of people worrying that the U.S. could end up like Japan—unable to pump up the economy no matter how hard the central bank tries to ease monetary policy. I don't see many parallels to worry about, however. For one, the yen's value has been rising for decades, which is prima facie evidence that the Bank of Japan hasn't really tried all that hard to increase the supply of yen relative to the world's demand for yen. In contrast, the dollar is very near its all-time low relative to other major currencies, so we know the Fed has been far more accommodative, historically, than the BoJ. Second, M2 velocity in Japan has been declining almost nonstop for the past 30 years, whereas M2 velocity in the U.S. has been relatively stable on balance (though quite volatile at times). This suggests strongly that there are some big structural differences between the two economies. The BoJ has traditionally been much more cautious than the Fed, and the Japanese have been much more willing to hold on to their currency (e.g., by saving more and borrowing less) than U.S. consumers. All the evidence points to rising money velocity in the U.S. This, coupled with the Fed's continued willingness to supply tons of money to the system, strongly suggests that 1) the U.S. will avoid depression, 2) the U.S. economy is very likely to continue growing, and 3) rising inflation, not deflation, is the most relevant concern for investors. For the time being, this should translate into continued weakness for the dollar, and continued strength for commodities, gold, and equity markets. No one seems quite prepared yet to proclaim that we've seen the bottom in housing, but from the looks of this chart the bottom occurred quite awhile ago. After adjusting for inflation (I'm using the PCE deflator here), real home prices have risen four months in a row, at a 12% annualized pace. Since the Case Shiller data involve a lag of several months (i.e., the August figure is the average of prices for the April-June period), it would appear that the bottom in housing prices happened last March. At that point, prices in real terms had fallen by about one-third relative to their all-time high in mid-2006. Once again we see evidence that markets can solve apparently intractable problems. All it took to fix the housing bubble was lower prices and lower interest rates. Demand is now outpacing supply, as the second chart shows. Skeptics will counter that the rebound is only temporary, because banks have been very slow to put their foreclosed properties on the market, and the government's $8K tax credit for first-time homebuyers is going to be phased out. I can't refute those arguments, but it seems to me that there has been a sea-change in the dynamics of the housing market. Clearly we are no longer in free-fall; there has been a major price adjustment, and there has been plenty of time for attitudes and underlying dynamics to adjust. It is also the case that the broader economic and financial fundamentals have improved considerably in the past six months, and monetary policy has been extraordinarily accommodative for the past year. I think the turnaround in the housing market is for real. P.S. : Of course, this index is an average of 20 major housing markets, and so it could mask difficulties in one or more areas. Housing is a local phenomenon, and aggregating to national trends is risky. But still I think the evidence is pointing to improvement in a market that has suffered for several years. According to the Conference Board's survey of consumer confidence (top chart), released today, things deteriorated in October. The University of Michigan's survey (bottom chart), released about 10 days ago, showed a similar setback. I've never paid much attention to surveys of confidence, mainly because they tend to be lagging indicators. As these charts show, consumers are often quite happy until just before a recession starts, and quite depressed well after a recovery begins. If there is any message to be drawn from the recent survey data, it is that the bottom in economic activity was a couple of months ago—further confirmation that the recovery started last summer. I post this update to industrial metals prices because it is one of the key, market-based indicators that I follow, and it has registered a new high today that is 80% above its low of last December. Industrial metals prices are doing very well, and I believe that is a good sign that a) the global economy is recovering nicely, and b) monetary policy in most major countries is quite accommodative and needs to be tightened. I don't know how much of the rise in prices is due to easy money, but if I had to guess I would say about one third, with two-thirds being due to an ongoing strengthening the global economy. For most of this year, the economic skeptics have argued that higher commodity prices were a misleading indicator of global growth, mainly because they thought that China was mindlessly stockpiling commodities in an attempt to reduce its dollar exposure. I argued instead that this was an unreasonable assumption, because virtually all commodities were rising, global confidence was rising, monetary velocity was rising, swap spreads were moving back to normal, credit spreads were declining, and stock markets were rising. In short, I saw numerous indicators of recovery that all agreed with each other. The "China stockpiling" theory did a poor job of explaining how all these things could be happening. Rising commodity prices were among the many "green shoots" that signaled recovery long before the market was prepared to believe in one. They continue to reflect a fundamental improvement in the economy, and they are sending a strong message to the world's central banks, especially the Fed, that a tightening of monetary policy is long overdue. The sooner the Fed gets the message, the better for everyone. The first chart gives you the historical context for Treasury yields, and the second chart focuses on the recent action. When the 10-yr Treasury hit 2% at the end of last year, that was a sign that the market was convinced that we were in for a huge depression and deflationary environment. The world was so desperate for the safety of T-bonds that yield was almost irrelevant. Since then, the reality has been much better than expected. The simple fact that the economy has avoided a depression is probably enough to explain why stocks and Treasury bond yields are sharply higher. Yields are still relatively low from an historical perspective, however, and this is one reason why I have been saying that the market is still relatively pessimistic about the future. No one is ready to believe that we will have a normal recovery (Pimco's "new normal," which calls for a future of very disappointing growth, is all the rage these days). Everyone is worried about the deficit, about big and bigger government, and about higher taxes. Many worry that the Fed won't tighten, that inflation will be huge, and that the dollar will collapse. Others worry that the Fed will tighten, and that this will kill the economy. There is no shortage of things to worry about these days, and that is a good sign that the stock market is not yet in "bubble territory." If Treasury yields move above 4%, then that would be a sign that the market was buying into the notion of a decent, but not spectacular, recovery. Higher yields would most likely go hand in hand with the beginnings of a Fed tightening, and the Fed is not going to tighten until they are confident the economy is recovering. If Treasury yields move back to 5%, that would be a sign that the economy was doing pretty well, and/or that inflation was expected to move higher. In short, Treasury yields are a decent barometer for how optimistic the market is about the economy's future prospects. The higher they go, the better things will be. Markets are skittish today, struggling through yet another bout of nerves, struggling with yet another wall of worry. Will the Fed change its language at next week's FOMC, laying the foundation for an earlier-than-expected reversal of its quantitative easing? Will massive Treasury bond auctions combined with a tighter Fed push yields higher? Will higher yields threaten the economy? Will Congress allow the homebuyer's credit to expire, thus removing vital support from this fragile market? I'm not worried about concerns such as these. I would dearly love to see the Fed start tightening, since I think it is already overdue. The Fed should be paying attention to all the green shoots out there, and they should be worrying about how weak the dollar is. A tighter Fed would restore confidence to the dollar, and since this recovery is all about the return of confidence, that's exactly what the economy needs. The worst thing would be if the Fed refused to acknowledge the signs of recovery and the weakness of the dollar. The prospect of higher rates coming sooner than the market expects would provide strong support for the dollar. A stronger dollar, coming off such a low base, would make U.S. investments much more attractive to foreigners. Strength is always better than weakness. Yields today are so low that they could increase an awful lot before they posed a threat to the economy. Plus, a tighter Fed would send a message to the markets that things are indeed improving; it would be the equivalent of the Fed endorsing the notion that the economy is on solid ground. Also, as I've mentioned several times before, higher yields are actually good for households, since U.S. households have more floating rate assets (e.g., money market funds, bank CDs) than floating rate liabilities (e.g., adjustable rate mortgages); higher yields work out to be a net plus for households. Higher Treasury yields would be bad for Uncle Sam, since they would increase the cost of funding trillion-dollar deficits. But they wouldn't necessarily mean higher borrowing costs for the private sector. Credit spreads are still unusually wide, and they should get narrower as the economy recovers. A tighter Fed and higher Treasury bond yields can co-exist with flat or even lower yields on corporate bonds; in fact, that's what typically happens in a recovery. If the economy continues to enjoy just a modest recovery (3-4% real GDP growth), then Federal revenues should do better than most are forecasting, thus mitigating the size of the future deficit. Regardless, the deficit is still going to be so gargantuan that it will be extremely difficult for Congress or the administration to push through big-spending plans such as healthcare or cap-and-trade, and that will be a good thing for the economy and for confidence. As for the homebuyer's tax credit, letting it expire would be a good thing. We don't need such distortions in the marketplace; the housing market is perfectly capable of recovering on its own. Prices have fallen significantly, borrowing costs are quite low, and activity is picking up in many markets around the country; optimism is already returning. Given time, markets adjust and recovery; that process is well under way. So I am still optimistic, and I can still see light at the end of the tunnel despite all the market's concerns. Blogging has been light the past few days, mainly because I went on a quick getaway with my brother (both of our wives were traveling) to Palm Springs. We stayed at our favorite spot there, the Ingleside Inn. It's right off the main drag, and it's like a time machine to the past. Every staff member has worked there probably forever, and there are only 30 rooms. Pictures of celebrities who've stayed there are everywhere. One that I recall shows a newlywed couple with a quote from some celebrity saying "Everyone should get married at the Ingleside Inn at least once in their life." The restaurant, Melvyn's, is great, the prices are extremely reasonable, and the service impeccable. After dinner we each had a Laphroaig on the rocks that must have had 3 ounces of scotch, but cost only $10. 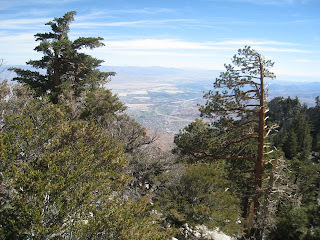 Friday morning we went up the Palm Springs Aerial Tramway to Mt. San Jacinto. As a native of So. California, I'm embarrassed to say that the last time I did this was back in the 1970s, and I just went up and then came back down. The tram has been seriously upgraded since then. It holds 80 people at a time, and rotates slowly as you soar 6,000 feet in a matter of minutes, passing huge columns of rocks. We then spent most of the day hiking on beautiful trails at an elevation of 8,500-9,000 ft., surrounded by 10,000 ft. peaks. The hiking area is immense, and while we covered about 6 miles of trails, we saw but a tiny fraction of the state park. A late lunch at the restaurant, with magnificent views of the desert below, finished the day. This shot was taken near the restaurant. You can see the Salton Sea in the background on the right, and it is some 50 miles distant. Here's an updated version of a chart I haven't shown in awhile. Obama continues to face declining popularity, driven of late by a declining number of strong supporters. Healthcare reform is just not a popular concept, and cap-and-trade remains in big trouble. All of this is good for the economy, however, since it means that the risk of ever-expanding government and rising tax burdens is declining. This week's report on new unemployment claims follows the trend in place since last March: slow, irregular improvement. Since that is getting boring to follow, I thought I would show this chart, which represents the number of individuals who are unemployed and are receiving unemployment benefits (and who filed for benefits at least two weeks ago). This also shows slow, irregular improvement. Things are getting better, but it will take many more months yet before anyone can claim that the economy has fully recovered. The economy is recovering, but it is facing stiff headwinds. One source of the headwinds is the government's own "stimulus" spending, since it was non-stimulative in nature (i.e., mainly transfer payments, plus modest infrastructure spending stretched out over many years), and it threatens to result in a significant rise in tax burdens. This puts a damper on "animal spirits," in addition to absorbing a lot of the economy's savings which could otherwise have been put to better use. At the request of my friend Doug R, which in turn was a reaction to my post earlier today, here's a chart showing real crude oil prices and recessions. He thought recessions were basically a direct result of a spike in oil prices, but wanted to see the evidence. Here it is. My reading of this chart is this: recessions are often, but not always, associated with a spike in real oil prices. I think there is something else going on behind the scenes that is more important than oil prices, and that something is monetary policy. Every recession on this chart was preceded to a significant degree by a tightening of monetary policy, and this observation taught me long ago that it is monetary policy that creates recessions. With one exception, every recession in the postwar period has been preceded first by easy money and then by a significant rise in inflation and a subsequent tightening of monetary policy. When inflation rises, it typically boosts the prices of raw materials, oil included. So the rise in real oil prices precedes some recessions is really just a symptom of rising inflation, which in turn is the result of easy monetary policy. You can see this clearly in the next chart. Tight monetary policy invariably produces high real short-term interest rates (the blue line) and a very flat or inverted yield curve (shown here as a low or negative value of the red line). Easy money, on the other hand, pushes real borrowing costs to very low levels and results in a very steep curve (shown here as a high value of the red line). The one interesting "exception" to my recessions-are-caused-by-tight-money rule was the recession of 2001, since it was preceded by tight money but not by rising inflation or exceptionally high oil prices. The Fed tightened policy in the late 1990s not because inflation was rising, but because they were afraid it might; this was a very unusual period in which the Fed was uncharacteristically preemptive in its policy actions. Sadly, although the tightening was probably not required, it still produced some painful consequences. The key factor triggering recessions remains, however: tight money. I would note also that while the 1990-91 recession saw a big but brief spike in oil prices, this was mainly due to the outbreak of the gulf war. Since I don't think oil prices have yet risen by enough to result in any meaningful change in consumer behavior, and inflation hasn't yet risen by enough to trigger a big tightening in monetary policy, and the Fed is still very easy, I don't see any reason to fear a recession or double-dip recession. A good supply-side friend, Don Luskin, yesterday wrote a very nice article in NRO and on his website that speaks to Treasury's apparent lack of concern for the weak dollar. The fact is that the Obama Treasury is playing a very difficult hand of poker here. Its failure to wave a magic wand and restore the prestige of the U.S. dollar does not originate in a willingness to acquiesce in American decline. Secretary Geithner told me that he rejects what he called the “existential narrative” so popular among global economic elites — the declinist doctrine of so-called “global imbalances” that envisions a lazy America being overrun by hard-working Asians. No, what’s holding the Treasury back from delivering a stronger dollar is, more than anything else, the absence of magic wands in the real world. The closest thing we’ve got is the Fed’s magic checkbook, and that’s been wide open for more than a year now. So if you’re worried about our currency, you can spend your time more wisely than hoping for a “strong dollar” speech from Tim Geithner, or even trying to get him to lay off the Chinese for a while. Instead, hope for Ben Bernanke to start closing the Fed’s checkbook — before runaway inflation depreciates the dollar both on foreign exchange markets and in every American’s wallet. Despite popular perceptions to the contrary, the fate of the dollar rests entirely in the hands of the Fed. Since the Fed has been willing to over-supply dollars to the world at a time when the demand for dollars has been falling, the dollar is losing value against other currencies. This is just basic econ 101: supply more of something than the market wants, and its price will fall. Overall, government spending doesn’t boost national income or standard of living. It merely redistributes it—minus the share it spends on the bureaucracy that collects and spends our tax dollars. The vast bulk of the "stimulus" spending that Washington has cranked up won't do anything to stimulate the economy, as I and many other economists have argued all year long. That's because almost all of the stimulus spending is essentially a transfer of money from one person to another, while a small fraction is going to be used to actually build new infrastructure (and most of that won't happen for a long time). The only kind of stimulus that makes a difference is the kind that focuses on changing people's behavior. Tax income less and you will get more work; tax capital less and you will get more investment; tax saving less and you will get more saving. Will someone please explain this to Mrs. Nancy ("Clueless") Pelosi as she flirts with the idea of yet another stimulus package? Crude oil is in the spotlight these days, as its price climbs above $80/bbl. The trigger for higher prices appears to have been the news that gasoline inventories were much lower than expected. Surprise! Lower prices earlier this year combined with a rebounding economy added up to increased demand for gasoline. Is this a cause for concern? Hardly. Recoveries do not bring with them the immediate seeds of their own destruction. Prices are up because demand is up. The economy is stronger. If there is any cause for concern, it is that this is one more of many examples of why monetary policy is too easy these days, and why the Fed should be tightening. These charts help put things in perspective. To begin with, in real terms oil is no more expensive today that it was in the early 1980s. It's actually much less expensive, when you consider that consumers spend about half as much of their disposable income on oil today as they did back then. The reason for that is conservation: our economy has become far more energy efficient. We use about half as much oil per unit of output today as we did back then. U.S. oil consumption today is about 19 mbd, which is the same as it was in 1980, and that's a rather remarkable fact since the economy has grown about 120% since then. This chart of copper prices looks like a lot of commodity price charts these days: prices are up significantly from last year's lows. I have been encouraged to see rising commodity prices all year long, because I think they mean that a) monetary policy has been accommodative, thus removing the threat of deflation which had weighed down equity markets late last year and earlier this year, and b) global economic activity is picking up, thus removing the threat of depression or deep recession that had weighed down all markets. In short, since early this year commodity prices have been telling us that the "sum of the market's fears" (i.e., depression and deflation) were completely misplaced. Thus it made sense to be bullish. Meanwhile, the dollar has been declining against most other currencies since March, and is closing in on its all-time lows. It's not the end of the world, though, since we've been here before (the dollar was about 5% lower than it is today throughout last year's second quarter). But it's high time that the Fed took notice of both the dollar and commodity prices and started to reverse its quantitative easing before it's too late. Money is plentiful and inflation pressures are building. The stock market is confirming that the prospects for the future have brightened considerably. There is no longer a need for super-accommodative monetary policy. Once again Apple has far exceeded even the most bullish expectations with the release of its fourth quarter results. The stock is trading after hours at $202 as I write this, an all-time high. I first wrote about Apple last January when it was trading around $85, and I've been bullish all the way (I actually bought the bulk of my position back in 2002). A quick check of the stats on this blog shows that 70% of those who visit are still using Windows XP; 13% use Vista, and 11% use Apple's Mac OS. XP is now an ancient operating system, Vista is widely considered a failure, but Windows 7 is getting good reviews. So I expect that a lot of XP users are going to entertain the thought of upgrading (finally) to a modern operating system. Unfortunately the upgrade path is difficult and painful, requiring users to wipe their hard drive and reinstall all their programs manually. If they don't feel quite that adventuresome, they will likely consider alternatives such as simply buying a Mac instead. I know many people who have made the switch, and the most common observation is something like this: "gosh, it's so nice to use a computer that just works." Most of those XP users probably need to buy a faster, more capable computer in any event. So I see lots of room for Apple to gain market share against Microsoft in the OS market, and against other computer manufacturers in the hardware market. Meanwhile, Apple is the acknowledged innovator in its field, and the iPhone is rapidly becoming a major player in the smartphone market, with over 7 million sold in the most recent quarter. That's a winning combination: a small but rapidly rising market share, plus technological leadership and innovation that produces products that are a marvel. I just don't see how anyone can dethrone the Mac OS, Apple hardware, and the iPhone at this point. The competition is getting better every day, to be sure, but this race is Apple's to lose. XP users: please feel free to comment on your plans. Will you upgrade to Windows 7? Wait for awhile? Try a Mac instead? UPDATE: Apple yesterday announced new iMacs. Among their many features, possibly the most interesting one is the ability to use the 27" iMac as both a HD-screen quality computer, and as an optional monitor for a Mac laptop or Mac mini. Although the NAHB index of homebuilders ticked down in October, the index remains substantially higher than last summer's lows. Furthermore, the prices of homebuilder stocks are up an average of 140% from their lows of last November. All of this continues to confirm that the bottom in residential construction occurred a few months ago and that activity should start improving soon. Another update in a series. September data on outbound container shipments from two very large ports was a little weak, but still (as I read it) consistent with a continued rise in overall U.S. goods exports. The dollar has been weak enough for long enough to give some boost to exports, though I would hasten to add while falling currencies may temporarily boost a nation's exports, a falling currency inevitably leads to higher inflation and overall economic decline. Regardless, I think the main story here is that global demand has rebounded, not that U.S. exports are suddenly more attractive. An improving global economic outlook is a very positive backdrop for any economy at this juncture. I've been highlighting these charts for a long time now. They both help to understand what is behind the gigantic rally in equity markets today. As I see it, the fuel for the rally is rising confidence. Confidence hit rock-bottom last March, but it is now coming back. The Vix index in the top chart is a good measure for the fear and uncertainty that inhabits the market, and the decline in the Vix has tracked the rise in equity prices quite closely. Similarly, the dollar has had a very tight, inverse relationship with equity prices because as confidence has come back and fears have been reduced, the world's safe-haven demand for dollars has declined. Dollars that were being hoarded under the mattress or in money market funds are being converted back to other currencies and/or being spent, and that is driving the rise in economic activity that we see all over the world. In other words, rising confidence is reducing the world's demand for dollars, at a time when the Fed is still very willing to supply them—that is a perfect prescription for a dollar decline and a reflation of economic activity and prices. The stock market was priced to an economic catastrophe earlier this year, and it is now in the process of repricing to a less awful forecast for growth (my guess is that the market is now priced to tepid growth of only 2% or so). We could be headed for bubble territory (e.g., in equities, commodities and nondollar currencies), but I don't think we're even close yet. We're still working our way out of the depths of despair. Here are my favorite charts of the Federal budget situation. Things continue to deteriorate, and they have reached levels that were never before thought possible. In the post-war period, tax collections have never been weaker as a percent of GDP. Similarly, spending has never been higher. As a result the deficit now exceeds 11% of GDP. If there is anything good about this situation, it is this: all a smart politician needs to do is to hold these charts up to the TV cameras, much as Ross Perot did in his heyday, and show the public that we are on an unsustainable course, and that we need a major rethink about how government should be managing our economy. It shouldn't be hard for anyone to explain that it is the height of fiscal irresponsibility to proceed with a massive expansion and restructuring of our healthcare system (underwritten by taxpayers), at a time when government spending is already out of control. Moreover, embarking on a major cap-and-trade-driven increase in energy prices (in the name of saving the planet, even though this is the coolest year in the last decade) that would almost certainly weaken the economy, should at the very least be delayed several years until we can approach the problem from a position of strength and greater understanding. And of course, it would be imperative to assure the country that tax rates are not going to go up. It is time to focus on what is left of the toothless stimulus package (to put a nice spin on it), with the objective of making those funds actually stimulate the economy instead of creating make-work projects, growing the size of government bureaucracies, and transferring trillions of dollars from top income earners to low income earners. We need to use that money to increase the incentives to work and invest, and that can happen only if we cut marginal income tax rates, corporate income tax rates, and the tax rate on capital. We need some major reductions in government spending and income redistribution efforts, and some major emphasis on helping the private sector pull us out of this mess. In dollar terms, Brazil's stock market is now up 205% (that's a three-bagger) from last year's lows. Not only has the stock market rebounded, but the real has rebounded as well. Brazil's currency is tracing the mirror image of the dollar; as the dollar closes in on its prior lows, the real is closing in on its prior highs. This is a stunning recovery by any measure. News reports earlier today floated the possibility that emerging market economies might impose controls on capital inflows in order to try to stem the appreciation of their currencies. Brazil's president Lula instead took the high road, saying "the government has no plans to tax capital inflows as a way of preventing the country's currency from strengthening further." Very good news for Brazil. U.S. industrial production in September rose more than expected. Since bottoming out last June, industrial production is up at a 11.8% annualized rate. Japanese industrial production suffered more, but has rebounded even more strongly. 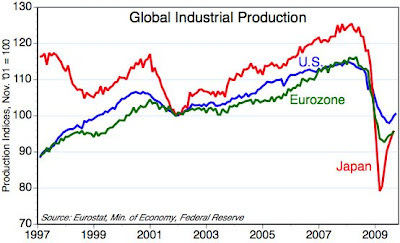 European industrial production is also turning up. I think that when forces like these are set in motion they are very hard to stop. The process started about a year ago when global demand collapsed due to fears of massive bank failures. Inventories rose involuntarily, so production was cut back. Now demand has returned, and inventories are declining, and production is being ramped back up. This is a classic inventory cycle that would be difficult to derail, especially since all the coincident indicators of demand (e.g., commodity prices) are still very strong. In the end, this recovery rests on a foundation of renewed confidence and declining fears. The recovery is now in a positive feedback loop where increased confidence leads to increased demand and production, which in turn leads to increased confidence. This is a 5-year chart of Bloomberg's constant maturity commodity index, which is composed of 26 different commodities in five major groups: energy, agriculture, industrial metals, precious metals, and livestock. As the chart shows, commodity prices have recovered about half of what they lost last year, and are still rising. I believe this demonstrates two important developments: 1) global demand has rebounded significantly from its end-2008 lows, and continues to firm; and 2) central banks around the world are pursuing accommodative monetary policies, which are facilitating the recovery since they have satisfied the fear-induced demand for liquidity. This may well end in another inflationary bubble, but the more important thing to focus on now is that the commodity price surge is a good coincident indicator of the rebound of global growth and as such is extremely positive. This chart comes from the Intrade prediction market, and it shows the odds of a government healthcare plan being enacted into law by the end of this year. In June the odds were 50%, whereas today they are 17% and falling. The looming failure of ObamaCare is undoubtedly another one of the reasons that the stock market is doing better these days—whatever is bad for Obama is good for the economy. I know some people will take offense at this, thinking it is a partisan attack, but I sincerely view these matters as extremely important. If the government gets fiscal policies wrong, or if the government creates a new bureaucracy that will end up costing gazillions of dollars and making the economy less efficient in the process, this is BIG news. The market, I firmly believe, would much rather see a smaller government than a bigger government, and healthcare is a significant part of that equation. For most of the past year, there has been a very strong correlation between T-bond yields and crude oil prices, as this Bloomberg study shows. In the past month, however, bond yields have lagged the rise in crude prices. Crude has now reached a new high for the year, while bond yields are 50 bps below their highs for the year, which occurred about four months ago. On the margin, however, over the past few weeks the modest rise in T-bond yields has been driven almost exclusively by rising inflation concerns; TIPS real yields have been flat while nominal yields have risen, with the result that the breakeven inflation rate has risen. This makes sense, since higher oil prices are quite likely to result in higher consumer price inflation in coming months. It would appear to me that bond yields have some catching up to do with oil prices. After the collapse in commodity prices late last year led to a sharp decline in headline measures of inflation (e.g., the CPI index fell 3.2% in the fourth quarter of last year), one of the more significant things to happen on the inflation front this year is the failure of deflation to appear. I've commented on this several times in the past. This is quite important because the prevailing/most popular theory of inflation is an offshoot of the Phillips Curve theory of inflation. This theory says that inflation declines when the economy weakens—when the economy is operating at a level that is below its potential, which means there are a lot of idle resources in the economy. Since the economy has been operating at a level significantly below its full potential (perhaps 7% below) for the entire year, the Phillips Curve theory of inflation would have predicted the emergence of at least some degree of deflation by now. But that hasn't happened, and that is the dog that didn't bark. The Fed has been mightily concerned about the deflation threat all year for just this very reason. That is why they have been so easy, and plan to remain very accommodative for quite some time, since it will likely take many months or even years before the economy fully recovers. Monetarists and supply-siders, on the other hand, prefer to see inflation as a monetary phenomenon. Supply-siders in particular like to watch market-based indicators of how easy or how tight monetary policy is, and to use these as a guide to what inflation is likely to do. For most of this year, these indicators have been suggesting that inflation pressures are rising, not falling: the dollar has been very weak of late, commodity prices have been rising almost across the board, the yield curve is very steep, gold has risen to a new all-time high above $1000/oz., and interest rates are very low relative to measured inflation. For the first nine months of this year, the CPI has risen at a 2.7% annualized rate, which is slightly higher than its average over the past 5 and 10 years. The core CPI (ex food and energy) is up at a 2.0% rate over this same period. Neither index shows any signs of significant slowing. The deflation threat the Fed has feared has so far failed to materialize, and inflation instead has continued its trend of recent years. Since monetary policy typically acts with significant lags, the easy money of this year is likely to translate into a quickening in the pace of inflation next year. 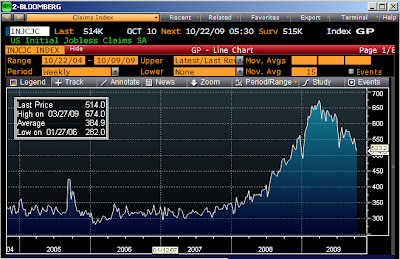 Unemployment claims continue to decline. They still have a long way to go to get back to "normal" (which would be 300-350K per week), but they are definitely moving in the right direction. My regular computer has to go into the shop later today for a major repair, so I am somewhat limited in my charting and calculating abilities. Hope to be back up to speed by Monday or Tuesday. Here's a picture of what a V-shaped recovery looks like. 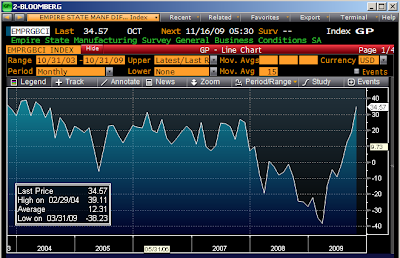 It's the Empire State (i.e., New York) manufacturing survey of general business conditions, and it has rebounded strongly in the past six months to a 5-year high. The gain in the index far exceeded expectations, and was widespread; what's more, the subindices covering employment and the workweek were exceedingly strong. Earlier this year we saw "green shoots" appearing in various parts of the economy and in the financial markets—things like the declining swap spreads and a downturn in unemployment claims that were foreshadowing the end of the recession. Now we see "V" signs like this which tell us that the recovery is in full swing. Very encouraging. Also in the "V" signs category: equity prices, corporate bond prices, commodity prices, and the ISM index. Another quick update to one of my favorite charts. Implied volatility has fallen to a new low for the year, and stocks are at another new high. The market is gradually losing its fear of the future, but I note that at 22.8, the VIX index is still almost double the level that prevails during times of relative tranquility. And credit spreads, a key measure of confidence, are still at levels that in the past have been consistent with recessionary conditions. So we might say that the market's improvement to date amounts to a recovery from conditions of extreme fear and uncertainty (and a market that was braced for a fearsome depression and global deflation), to a condition of moderate fear and uncertainty (and a market that is braced for a modest recession). There is still plenty of room for further improvement. 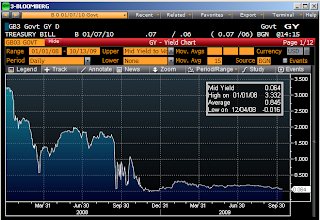 Here's a Bloomberg screen showing the yield on 3-mo. T-bills since the beginning of last year. The world's favorite safe asset is now yielding close to ZERO (actually, 0.06%), and that yield has been declining for most of the year, despite the double-digit gains recorded by domestic and global stock markets, corporate bonds, industrial commodities, gold, and crude oil, and despite the strong fundamental backdrop of sharply lower swap spreads and implied volatility, and increased liquidity. With the Dow reaching 10,000 today, it is up 53% from its closing low last March, and the S&P 500 is up 61%. It only makes sense to hold zero-interest cash if the prices of alternative investments continue to decline. If the economy doesn't continue to deteriorate significantly, then cash will prove to be a major embarrassment." With the underlying fundamentals (e.g., swap spreads, agency spreads, implied volatility, liquidity) improving, the economy is not likely, in my view, to deteriorate enough to keep the prices of other assets declining. Thus, as time passes, investors will be compelled to trade in their cash (or increase their borrowings, since borrowing costs will be extraordinarily low) in exchange for riskier assets. And that in turn will set off a virtuous cycle to the upside which could be rather spectacular. It took a few months for the rally to get started, and we had to suffer through the awful February-early March collapse, but we're clearly witnessing one of the most spectacular rallies in Wall Street history. The Fed helped get this rally going by ensuring that there was no shortage of money (another favorite theme of mine). Even though people have been terrified of depression and deflation, and even though people continue to be awfully worried about a double-dip recession, a collapse of the commercial real estate market, another wave of residential defaults, the deleveraging of the household sector, and/or a potential Fed tightening, there remains the fact that the Fed is keeping short-term interest rate extraordinarily low. To willingly hold cash that yields zero, you must be convinced that there is death and destruction awaiting at every turn. The market is climbing terrifying walls of worry, yet on the margin people are slowly being forced to reduce their money balances and increase their exposure to risk, and consumers are spending some of the cash they have hoarded, and it all adds up to a virtuous cycle that is giving us a V-shaped recovery. As long as the economy fails to deliver death and destruction, the market finds itself compelled to keep this virtuous cycle going. The Fed should have started tightening awhile ago, but they are throwing caution to the wind in order to ensure a recovery. What the Fed wants, it can surely get. It may get more than it wants, in the form of asset price bubbles and higher inflation, but that remains to be seen. In the meantime, I don't see any signs that equities are overpriced (the Dow has only just returned to levels it first saw over 10 years ago) or that the market is overly confident (credit spreads are still very wide and implied volatility is still unusually high). Crude oil has been trading around $70/bbl for the past four months and shows no signs of weakness. 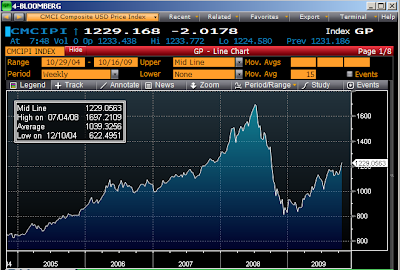 Relative to gold, oil is trading a little on the expensive side, but cheaper than it was for most of the 2000s. I continue to think that the commodity story (i.e., with almost all commodities trading higher this year and still firm) is due to a combination of a) rebounding global economic activity, and b) accommodative monetary policy from almost all central banks. This is not only a recovery but a reflation of sorts. It could turn ugly if prices move substantially higher and central banks are slow to reverse course, but for now it can only mean that economies enjoy a positive feedback loop of rising confidence, expanding activity, and stronger cash flows. Stay bullish. Here are two versions of the dollar's value against other currencies. The first compares the dollar in nominal terms to a trade-weighted basket of major currencies (Euro, Yen, Pound, Canadian dollar, Swedish Krona, and Swiss franc), while the second compares the dollar in inflation-adjusted terms to a very large trade-weighted basket of almost all currencies. By either measure, the dollar is very weak and looks to be trending lower. The dollar is weighed down by extremely accommodative monetary policy, by profligate fiscal policy, by the specter of increasing regulatory burdens, by high unemployment and weak economic growth, and by the prospect of trillion-dollar deficits for as far as the eye can see. Everyone knows this, though—it's all on the front pages every day—and that arouses my contrarian instincts. With the dollar's value against other currencies and against gold near the bottom of historical ranges, it is undeniably cheap. It could get cheaper still (and I'm reminded here of Art Laffer's admonition that fiat currencies have no intrinsic value and can therefore be in perpetual decline), but selling the dollar at this point implies considerable risk. When tons of bad news is hitting the tape everyday, and the value of the asset in question has fallen to historical lows, to be bearish on the asset requires a firm conviction that things are going to go from very bad to really, really bad. For the dollar to rise you don't need to see good news, you just need to see news that is not awful. Mere bad news might suffice to keep the dollar from falling further. Modestly good news, such as an early move by the Fed to raise interest rates even by a little bit, or news which shows the economy is likely to simply avoid a double-dip recession, or news which indicates just the tiniest rightward shift in fiscal policy, might be enough to push the dollar higher. It's hard to fight the tape on this, but I continue to believe that the long-run prospects for the dollar are favorable. I think the economy is doing better than most give it credit for, I think the Fed is going to move sooner than most expect, and I think that policies in Washington are going to turn out to be less awful than the market fears. I'm not saying that everything is going to turn rosy, merely that I don't see things getting worse forever.